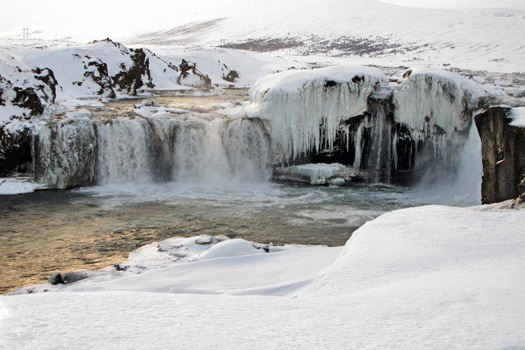 Some Northern Hemisphere types choose to avoid the iconic snowy season and head somewhere sunny and warm, but I say embrace the magic of the Christmas season and head to a real winter wonderland – Iceland. Last Christmas my friends and I spent six days in this isolated island nation staying in the capital Reykjavik and the country’s second largest city, snowy Akureyri. Here are a selection of tried and tested tips, tricks and suggestions to help you make the most of your festive Icelandic escape. Across Iceland there are a seemingly endless number of natural wonders to explore from mud pools and geysers to glaciers and waterfalls. 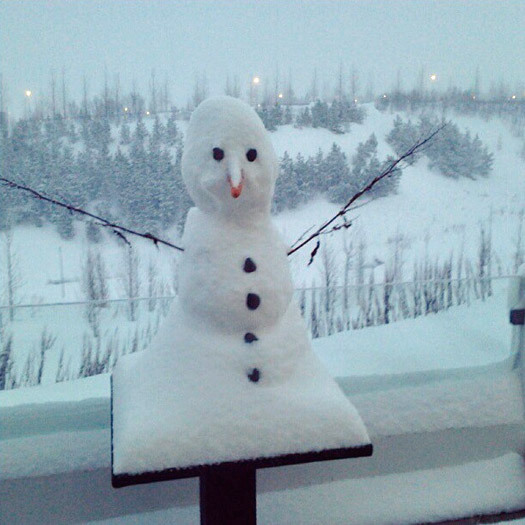 Under a blanket of snow, Akureyri feels quiet, calm and peaceful. Lights twinkle from every home and a giant illumined heart lit by 400 blubs pulses opposite the town on Mt Vaðlaheiði. 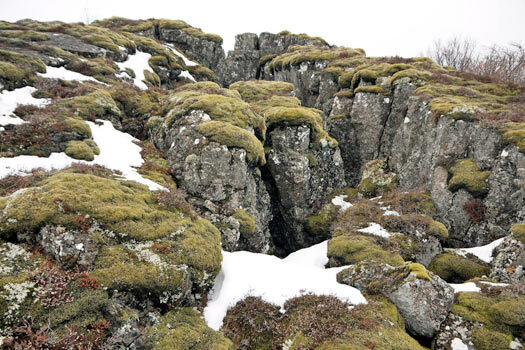 Wonder at Dimmuborgir’s beautiful lava formations (watch out for the Yule Lads), the frozen Goðafoss waterfall, and the Myvatn nature area. For something really special several companies offer year round horse riding and ice fishing tours – just remember to book in advance. 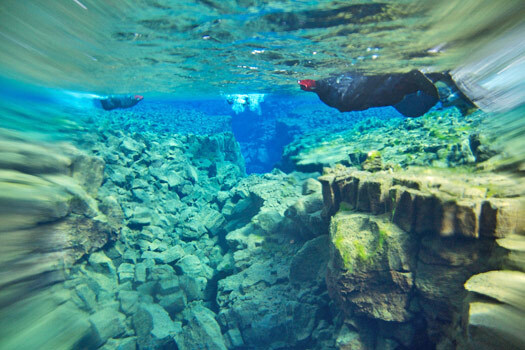 Just one hour from Reykjavik you can snorkel (or dive) in the incredibly clear, incredibly blue glacial waters of Silfra fissure in Thingvellir National Park. Often picked as one of the world’s top diving sites, visibility is between 150-300m. As you need a permit to snorkel and dive in the fissure the best way to visit is with a guided tour which also means all the equipment is provided. 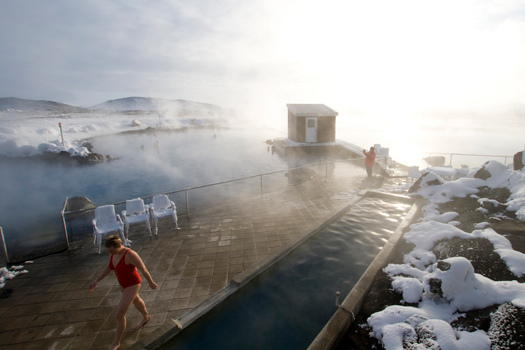 There are more than 170 thermal pools across Iceland and while the best known is the beautiful Blue Lagoon, my personal favourite is Myvatn Nature Baths, just east of Akureyri. It’s a freezing dash from the changing rooms to the pool, but once you’re in there really is nothing quite like lying back in the steaming hot waters while snow gently falls all around you. For as long as I can remember I’ve always wanted to race across a frozen landscape pulled along by a pack of wolf-like huskies so this was adventure to ticket off my bucketlist. One slight change of plan – we had no snow! 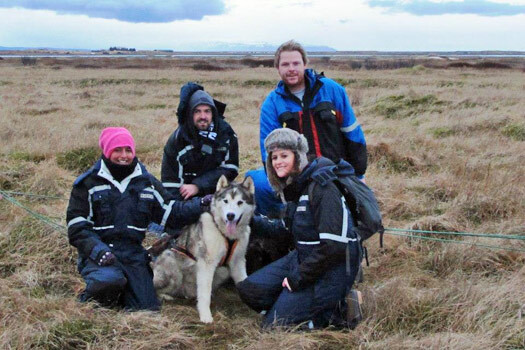 The crew at Dogsledding Iceland run daily trips ranging from an hour to a whole day. 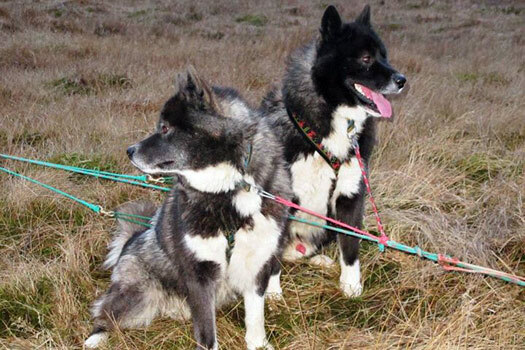 You’ll be escorted by one of their expert ‘mushers’ and a selection of their 47 dogs – a mix of Greenlandic Eskimos dogs, an Alaskan malamute, and Siberian and Alaskan Huskies – all are fluffy and beyond cute. Once decked out in our warm waterproof suits (very attractive) we make our way to the sleigh. These dogs clearly love their job because as soon as they saw us they were itching to hit the road, pulling at the reins and yapping at each other. There is a real science to how they order the animals with the most trustworthy and intelligent dogs leading and the more cheeky animals at the back. A couple of the dogs (brothers we discovered) were in a bit of a mood with each other, but a few stern words from our guide and we were on our way. 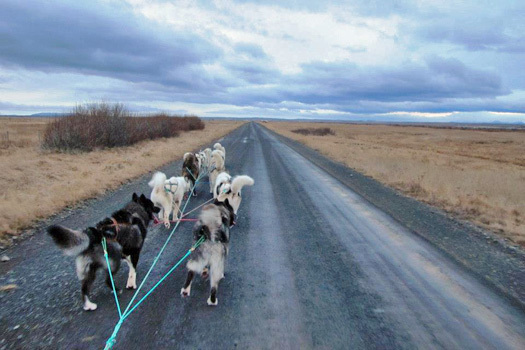 The strength of the animals is incredible as they effortlessly pull a heavy sleigh and five fully grown adults over a cold gravel road. When harnessed-up the dogs are in work mode, but as soon as they get off the leash they become cuddly, playful puppies ready for scratches and belly rubs. Despite the lack of snow, it was incredible experience racing across the Icelandic tundra. And as for the dogs, it took all my willpower not to sneak one home with me! In December, tours run from three different locations depending on weather conditions. 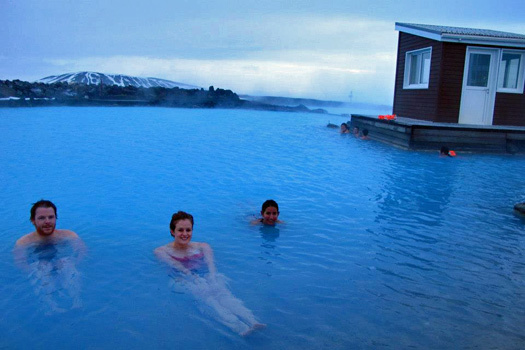 They are all within a 30-70min drive of Reykjavik and you’ll be give location details at the time of booking. Unfortunately for us the Northern Lights didn’t want to play ball (it was too cloudy during our stay to catch a glimpse of the elusive lights), but there are several ways to improve your changes of spotting then. Many hotels offer a wake-up service where they’ll give you a call if the lights should appear overnight and if you’re staying in private accommodation make sure you keep an eye on the Iceland Met Office’s Aurora forecast. 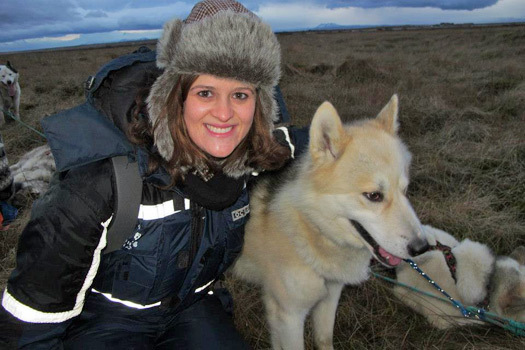 Several operators offer guided tours out of Akureyri and Reykjavik. 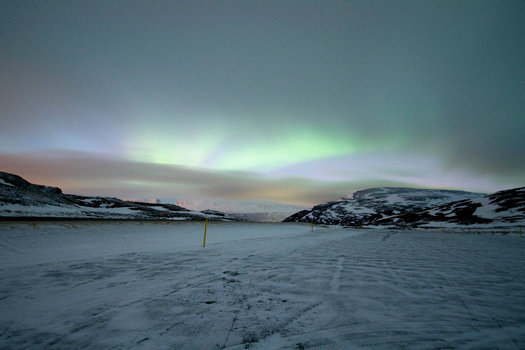 Aurora Borealis near Akureyri, Iceland. Photo by ToNG!? Christmas is the time when the Yule Lads, legends of Icelandic folklore, come out to play. 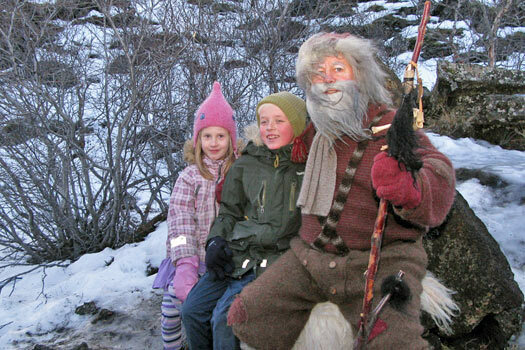 You’ll find them in the north of Iceland wearing either traditional Icelandic costume or a more conventional Santa Claus outfit. 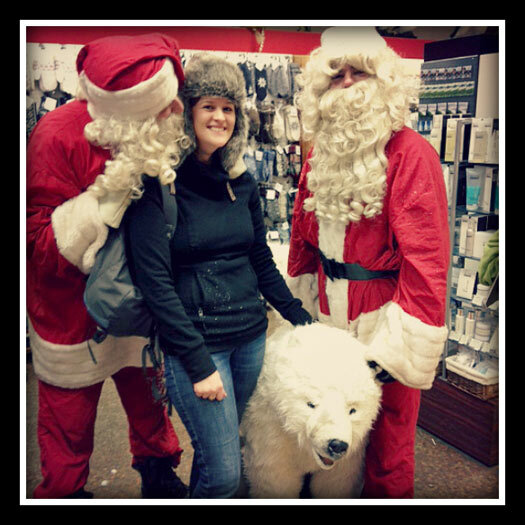 I actually got to meet a few of these mischievous fellows in a store in downtown Akureyri on Christmas Eve. After stopping for a photo they borrowed the shop’s giant polar bear and carried it off on a scooter – as you do. Numbered 13, the Yule Lads (jólasveinarnir or jólasveinar in Icelandic) visit the children of Iceland over the 13 days leading up to Christmas. During Yuletide the children place their best shoes by the window and each night a different Yule Lad visits and leaves gifts for nice girls and boys and rotting potatoes for the naughty ones. The names of the Yule Lads hint at the type of trouble they like to cause: Stekkjastaur (Sheep-Cote Clod), Giljagaur (Gully Gawk), Stúfur (Stubby), Þvörusleikir (Spoon-Licker), Pottaskefill (Pot-Scraper), Askasleikir (Bowl-Licker), Hurðaskellir (Door-Slammer), Skyrgámur (Skyr-Gobbler), Bjúgnakrækir (Sausage-Swiper), Gluggagægir (Window-Peeper), Gáttaþefur (Doorway-Sniffer), Ketkrókur (Meat-Hook), and Kertasníkir (Candle-Stealer). If you want to meet the Yule Lads for yourself you can join them in their pre-Christmas activities. From November 30, you can visit the Lads in the Hallarflöt area of the Dimmuborgir lava fields everyday between 1pm and 3pm. 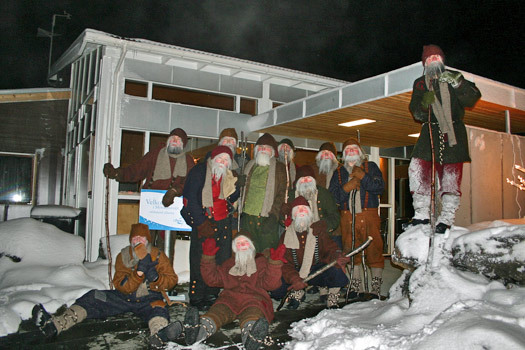 Then two weeks before Christmas, the lads come down from their mountain home to take their Annual Bath at Myvatn Nature Baths; this year it falls on Saturday, December 8 at 5pm. Meeting two of the Yule Lads in Akureyri, Iceland. Photo by Andrew Oxley. 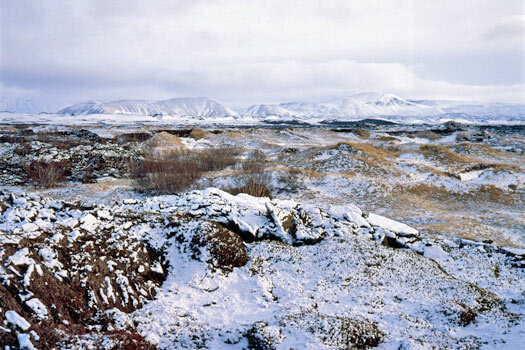 As with many Scandinavian countries, the big Christmas celebrations in Iceland take place on Christmas Eve. Everything shuts down from midday on Christmas Eve until December 27, though some restaurants and tourist shops will stay open in Reykjavik nearly all the city’s bars and attractions will be closed. If you’re staying outside of the capital make sure to get all your shopping done beforehand and have enough food to keep you going through the festival period. The first thing you’ll undoubtedly notice is that everything has a slightly eggy smell – that’s the sulfur. Layers, layers and more layers are your best friends in Iceland. Also, a good jacket, waterproof boots or shoes with a good grip, hats and gloves are a must. Don’t worry if you look less than stylish, everyone dresses for the weather not fashion in winter. 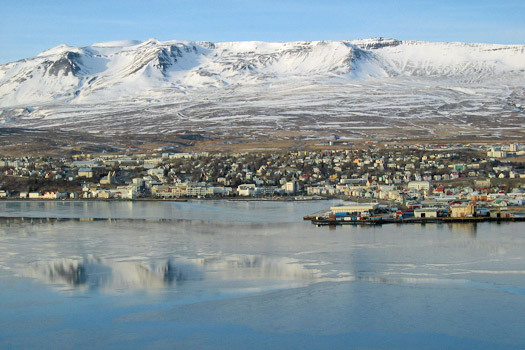 Search and compare cheap flights to Reykjavik. For total freedom during your trip you can’t beat hiring a car. A small, standard car will work on the roads around Reykjavik, but for anything more rural or further north you may want to upgrade to something with a little more power. Roads across the country are well maintained and regularly ploughed in winter, but you could still get caught out in a snow storm. Take care on gravel roads and always drive to the conditions. As the days are extremely short in winter (sunlight hours are between 10am-3pm) so make sure you plan carefully if you want to avoid driving in darkness. If travelling over Christmas, petrol stations will be open, but only on self-service.